A student came rushing into my classroom after lunch, excited and out of breath. "Teacher! Did you see all the cop cars outside?" "Yah! They're everywhere! We think it's a drug bust! There were more than eleven cop cars outside!" Which makes me wonder, exactly how much is "more than eleven"? I was supposed to make my students nominate a prom queen and king this week. Do these instructions seemed messed up to anyone else besides me? Have students raise their hands if they want to be nominated? That feels awkward. And embarrassing. SLOWLY eliminate the lowest voted nominee until we are left with one male and female nominee? Does this seem like cruel and unusual punishment to anyone else besides me? Our heating bill for the month was $90. NINETY BONES, FOLKS! I about threw up all over the living room when I saw that number popping out at me. Especially because Hubs and I could hold hands and stand in every room of our itty bitty apartment. AND especially because after a steep electric bill last month I went crazy in February, not allowing the heat to be left on for more than ten minutes, constantly turning lights off, etc. And yet somehow our bill was still higher! Then it dawned on me. Could this be the baths' fault? I have been averaging at least one hot bubble bath a day for the month of February. I can't help it. I come home exhausted from work, and all I want to do is melt into a hot bath. Not only is it amazingly relaxing, but I figured I would save on heat if I just kept warming my body by submerging it in scalding water instead of turning on the heat. Welp, looks like I just spent $90 on bubble baths. It was (almost) worth it. My hubby who's in charge of our electric bill says we don't pay for water here! I use all the water I want because of it! :) Enjoy your bubble baths, they don't count!! To the best of my knowledge, showers and baths contribute to both the water and heat bills. The water has to be heated somehow, no? Your heating bill is only $90? I think ours was $145 or something like that. BUT we aren't conservative with it. And I take a lot of hot baths. If you have an electric hot water heater than yes - if you don't (gas) then it wouldn't. Your bath tub is making me a bit jealous - I could use a nice long bubble bath today! But we don't have a tub. I swear Utah just kills you on electric bills. We lived in some pretty tiny spaces and paid out the nose for heat. Grrr. Keep taking the hot baths. Unfortunately, if you're trying to heat water it has to be done with electricity...so that hot water costs just as much to heat as your furnace. Also, that I commented on this adult topic with such knowledge makes me slightly depressed. Boo grown ups. Boo. I just love your stories about the goings on in your classroom. Very entertaining. A drug bust in Utah, with more than 11 cop cars!? The school must have been up in arms, ha! Thanks for your comment! I've been snooping around and I already love your blog! 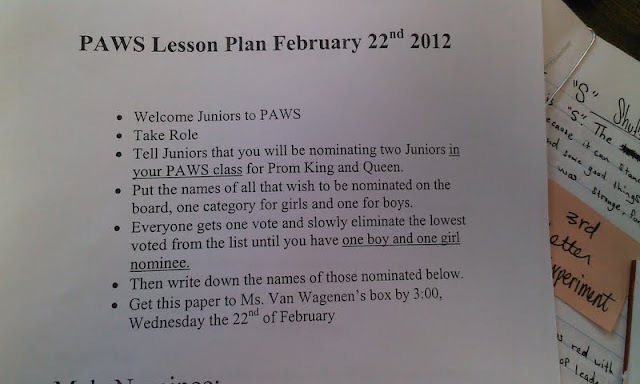 I'm a teacher too and those nomination instructions seem very odd and cruel to me too. I wish I could help you out on the heating bill, but my sweet husband pays that bill! sometimes running your heat just to take the chill off is a lot more expensive than just setting your thermostat to a certain temp and leaving it alone. your water heater is gas, right? i doubt your baths had anything to do with it. and yes, the whole nomination thing is seriously awkward!